Anyone who has gone fishing for salmon, watched them swimming upstream to spawn, or simply seen depictions in photographs knows they are a special fish. 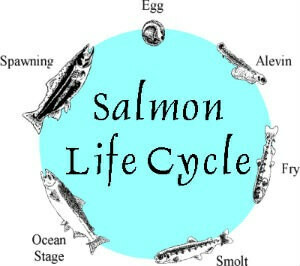 More than food, more than a game species, more than a natural resource, salmon evoke a mythology of their own, especially in the Pacific Northwest, where west coast salmon stocks have been in steady decline due to overfishing, logging practices, water diversion, natural predation, and other adversities. Upstream by Langdon Cook is a highly readable first-person account that offers multiple perspectives of this iconic fish. Blending history, science, politics, and, of course, the pursuit of a mighty fish by anglers, Cook takes the reader on a series of personal journeys with stops in Alaska, California, Oregon, and Washington while tracing the history and life cycle of salmon. Cook’s writing reminds me of John McPhee, with its clear, concise factual narrative combined with a literary journalist’s ear for conversational details and thoughtful observations which add depth to the fishermen, scientists, conservationists, chefs and other characters that the reader encounters in this highly readable book. Although Upstream provides plenty of confirmation that wild salmon are gravely threatened, it also shows that a new generation of fish conservationists are finding ways to make progress on the path to salmon recovery. I highly recommend this book to anyone interested in wild salmon recovery in the Pacific Northwest.